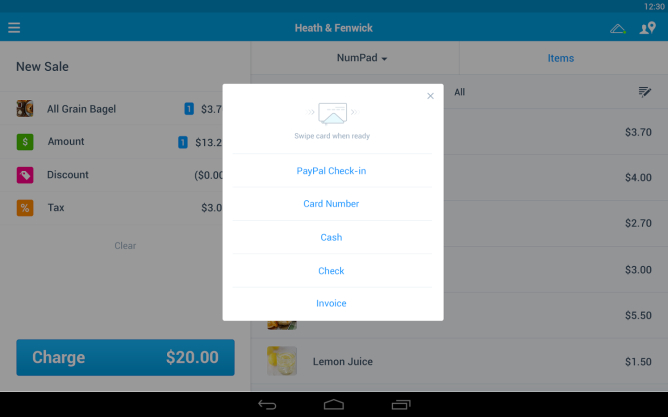 With the PayPal Here device you can accept credit card payments immediately. Don’t invoice customers, then waste time following up debts or mailing out reminder statements. Make it easy for your customers to pay right now and benefit from better cash flow. It’s rechargeable, links wirelessly to your tablet and has no monthly plan fees. Receipts can be emailed to customer showing a map of where the payment took place and the total charge or a breakdown of items. Accepting payments on the spot will save you creating invoices, posting out monthly statements, follow up phone calls and writing off bad debt. As well as that you make it easier for your customers to pay and finalise their transaction immediately, improving customer service.